Don't let "mic fright" ruin your next flight. Overcome that intimidation or refresh your skills with Comm1 as you exchange actual dialogue with Air Traffic Controllers from the safety of your desktop. This Windows™- and Mac™-based instructional CD-ROM is the closest thing to talking on the radio in the cockpit that you'll find anywhere. Simulate ATC communications in dozens of lessons over the full range of VFR or IFR flight situations. Master AIM and FAA-approved radio phraseology. Prepare for each exercise with narrated briefings. 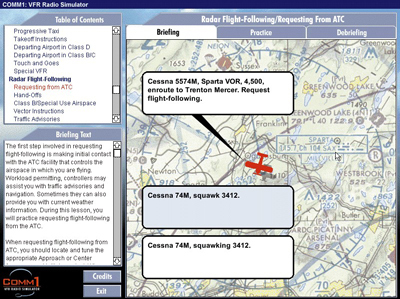 Learn to anticipate ATC instructions and sequences in every type of airspace. Operate the on-screen Comm 1, Comm 2, Nav 1, Nav 2, and audio panel — Comm1 radios tune and respond just like the real thing! Access the most widely used aviation resources for frequencies and communication information from the Airport/Facility Directory, AOPA's Airport Directory and Sectional Charts. Use actual aeronautical charts, airport diagrams and other visual aids in over 70 comprehensive lessons and scenarios. Talk to ATC and other pilots as you fly through Class B, C, D and TRSA airspace. If you get tongue-tied when you pick up the mic, then Comm1 will help you untie the knot. Being prepared with what to say, when, and in what order, is half the battle when mastering radio communication skills. Comm1 lets you practice selecting and making the correct radio announcements and responses in all types of flight settings. Learn when to transmit in the midst of "live" ATC exchanges. Receive immediate audio feedback to your recorded radio calls. Critique and compare your own radio speech with that of an expert. Practice making requests for Radar Flight-Following and Approach/Departure Clearances. You Do the Math . . .
Few pilots can afford to log all the hours necessary to concentrate on their radio proficiency in a rental aircraft. Comm1 offers you over 6 hours of self-paced, interactive communications training — that's $450 of dual time at most FBOs — for only $99.95. The most economical aviation communication training solution available anywhere. A sound investment in your own flight safety. Practice with Comm1 at home and make the most of your next flight! Requires CD-ROM drive, sound card, speakers, and microphone highly recommended. Review: As a student pilot Comm1 VFR CD was very helpful for a beginner to learn what to say and when to say it. It was very helpful but the program could be updated it's a little slow so it takes some time to go through. That said I would definitely recommend it to anyone it will help get comfortable on the radio no doubt!!! Review: Product crashes a lot. Pros: Informative. Practical. You can listen to and, if you want, read the lessons. Review: Great product. There are good and clear explanations and examples, and then you can practice recording your own voice. As English is not my first language it is particularly useful for me. But I really think this product is suitable even for native English speakers, since it is a learning tool for a specific technical subject: radio communication. Review: The interface is not fancy but the product does have excellent content and is organized and effective in conveying the concept of using the radio and was extremely helpful in my quest for my PPL. Review: This was helpful getting back into the flying after a 25 year hiatus. I live in a rural area and will be doing a lot of cross country flying, again. Good refresher for me. Pros: Really easy to use and straightforward. Simplifies the information. Review: This is a great product for practicing communication and getting a review on different airspace rules, nomenclature, phrasing, etc. Cons: I wish that the "quizzes" had you talk without seeing the word phrasing to choose from. I feel because of that I don't retain as much of the information. Q: Will this work with Windows 7? A: Yes, this will run on both 32 bit and 64 bit editions of Windows 7. Q: what version I need if I used on a MAC? A: The Comm1 software includes both the Windows and the Mac OSX versions. Q: Can this software be used on a MAC? Q: can u change channels with product? A: Yes, you can operate the on-screen Comm 1, Comm 2, Nav 1, Nav 2, and audio panel — Comm1 radios tune and respond just like the real thing! Q: Does this software require you to use the Comm1 Stereo Computer Headset w/Boom Microphone that is sold on this website or can you use any stereo computer headset? A: You are able to use any headset that has a microphone compatible for use with a computer. Q: Does this software work on Windows Vista? A: Yes, this software is compatible with Windows Vista. Q: Is this product comes with the mic or i have to purches separately? A: The headset and mic would need to be purchased separately. Designed as a quick reference guide or radio communications training self study guide for both VFR and IFR radio communication. Analog connection with 3.5mm audio in and audio out jacks for use with the Comm1 VFR and IFR Radio Simulator.